The Tale of Bygone Years (Old East Slavic: Повѣсть времѧньныхъ лѣтъ, Pověstĭ Vremęnĭnyxŭ Lětŭ) is a history of Kievan Rus' from about 850 to 1110, originally compiled in Kiev about 1113. The work’s name originates from the opening sentence of the text, which reads: “These are the narratives of bygone years regarding the origin of the land of Rus’, the first princes of Kiev, and from what source the land of Rus’ had its beginning.”:51 The work is considered to be a fundamental source in the interpretation of the history of the East Slavs. The Chronicle's content is known to us today from several surviving editions and codices that have been revised over the years and evince a slight degree of variation from each other. The historical period covered in the Tale of Bygone Years begins with biblical times, in the introductory portion of the text, and concludes with the year 1117 in the Chronicle's third edition. Russian philologist and founder of the science of textology, Aleksey Shakhmatov, was the first one to discover early on that the chronology of the Russian Primary Chronicle opens with an error. 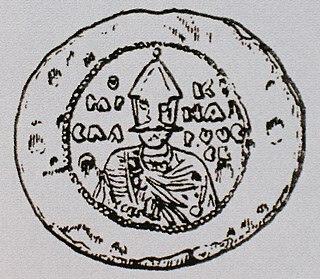 The Chronicle has it that “In the year 6360 (852), the fifteenth of the indiction, at the accession of the Emperor Michael, the land of Rus’ was first named.”:58 However, John Skylitzes' accounts of the Byzantine history show that Emperor Michael III did not begin his reign in 852 but rather a decade earlier, on January 20, 842. Because of the work's several identified chronological issues and numerous logical incongruities that have been pointed out by historians over the years, the Chronicle's value as a reliable historical source has been placed under strict scrutiny by the contemporary experts in the field (see “§ Assessment & Critique”). In the year 1116, Nestor's text was extensively edited by the hegumen Sylvester who appended his name at the end of the chronicle. As Vladimir Monomakh was the patron of the village of Vydubychi (now a neighborhood of Kiev) where Sylvester's monastery was situated, the new edition glorified Vladimir and made him the central figure of later narrative. :17 This second version of Nestor's work is preserved in the Laurentian codex (see § Surviving Manuscripts). A third edition followed two years later and centered on the person of Vladimir's son and heir, Mstislav the Great. The author of this revision could have been Greek, for he corrected and updated much data on Byzantine affairs. This latest revision of Nestor's work is preserved in the Hypatian codex (see § Surviving Manuscripts). Because the original of the chronicle as well as the earliest known copies are lost, it is difficult to establish the original content of the chronicle. The two main sources for the chronicle's text as it is known presently are the Laurentian Codex and the Hypatian Codex. The Laurentian Codex was compiled in what are today Russian lands by the Nizhegorod monk Laurentius for the Prince Dmitry Konstantinovich in 1377. The original text he used was a codex (since lost) compiled for the Grand Duke Mikhail of Tver in 1305. The account continues until 1305, but the years 898–922, 1263–83 and 1288–94 are missing for reasons unknown. The manuscript was acquired by the famous Count Musin-Pushkin in 1792 and subsequently presented to the National Library of Russia in Saint Petersburg. The Hypatian Codex dates to the 15th century. It was written in what are today Ukrainian lands and incorporates much information from the lost 12th-century Kievan and 13th-century Halychian chronicles. The language of this work is the East Slavic version of Church Slavonic language with many additional irregular east-slavisms (like other east-Slavic codices of the time). Whereas the Laurentian (Muscovite) text traces the Kievan legacy through to the Muscovite princes, the Hypatian text traces the Kievan legacy through the rulers of the Halych principality. The Hypatian codex was rediscovered in Kiev in the 1620s, and a copy was made for Prince Kostiantyn Ostrozhsky. A copy was found in Russia in the 18th century at the Ipatiev Monastery of Kostroma by the Russian historian Nikolai Karamzin. Numerous monographs and published versions of the chronicle have been made, the earliest known being in 1767. Aleksey Shakhmatov published a pioneering textological analysis of the narrative in 1908. Dmitry Likhachev and other Soviet scholars partly revisited his findings. Their versions attempted to reconstruct the pre-Nestorian chronicle, compiled at the court of Yaroslav the Wise in the mid-11th century. oral accounts of Yan Vyshatich and of other military leaders. Shem inherited the eastern region: Persia, Bactria, Syria, Media, Babylon, Cordyna, Assyria, Mesopotamia, Arabia, Elymais, India, Coelesyria, Commagene, Phoenicia. Ham inherited the southern region: Egypt, Libya, Numidia, Massyris, Maurentania, Cilicia, Pamphylia, Mysia, Lycaonia, Phrygia, Camalia, Lycia. Caria, Lydia, Moesia, Troas, Aeolia, Bithynia, Sardinia, Crete, Cyprus. Japheth gained north-western territories: Armenia, Britain, Illyria, Dalmatia, Ionia, Macedonia, Media, Paphlagonia, Cappadocia, Scythia, and Thessaly. The Varangians, the Swedes, the Normans, the Rus, and others were named to be descendants of Japheth. In the very beginning, humanity was united into a single nation, but after the fall of the Tower of Babel, the Slavic race was derived from the line of Japheth, “since they are the Noricians, who are identified with the Slavs.”:52 Banks of the river Danube in the regions of Hungary, Illyria, and Bulgaria are then described to be the place of original settlement of the Slavic people. Although, as a result of aggression on the part of the Vlachs, one group of the Slavs made their homes by the Vistula (Polyanians), another settled on the Dnieper (Drevlians and Polyanians), while the third resided along the Dvina (Dregovichians), and another group dwelt about the Lake Il’men. All this migration is dated back to the time of Andrew the Apostle who visited the Slavs on Il’men. The Polyanians built Kiev and named it after their ruler, Kiy. After the establishment of Kiev, under the rulership of Emperor Heraclius, many of the Slavs were invaded and oppressed by the Bulgars, Avars, and Pechenegs. At the same time, the Slavs from the Dnieper came under the predatory lordship of the Khazars and were forced to pay tribute. 852 -The principal date mentioned in the Chronicle, when the land of Rus’ was first named and when the Varangians first arrived at Tsargrad. 859 - Eastern Europe was divided amongst the Varangians and the Khazars. The former demanded tribute from the Slavs, the Krivichians, the Chuds, the Merians, and the Ves, while the latter imposed tribute upon the Polyanians, the Severians, and the Vyatichians. 862 - The Severians attempted to rid themselves of the Varangian lordship, which led to quarrels among the Slavic tribes and culminated in the summoning of the Varangians to rule over the Slavic tribes. As a result, the land of Rus’ was founded by three Varangian brothers: Rurik, Truvor, and Sineus. Shortly after, Rurik became the sole ruler of the newfound nation and built Novgorod. At the same time, a Varangian state was established in Kiev, with Askold and Dir at its head, that unprecedently posed a substantial threat to the Byzantine empire. 882 - Rurik’s successor, Prince Oleg, captured Smolensk and Kiev and united the two Varangian states. 883 – Prince Oleg conquers the Derevlians. 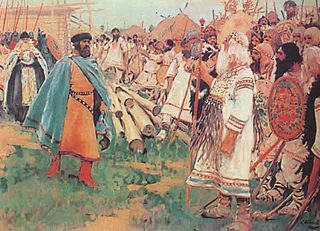 884-885 – Prince Oleg defeats the Radimichians and the Severians, bringing them under his rule. 907 - Prince Oleg launched an incursion against the Greeks, resulting in a favorable treaty for the Russians. The Greek emperor Leo conceded to provide allowances for Oleg's men, award them a right to stay and trade in Constantinople free of tax, and to enter unconditional peace. Ca. 945 – Prince Igor was murdered in the act of uprising by the Derevlians. His wife Olga assumed the throne following her husband’s death and brought revenge upon Igor’s murderers. Some of the Derevlians were burned in their homes, others were buried alive, while the remaining were simply slaughtered. Olga later ruled as a regent for her young son Svyatoslav, who went on to have an extensive military career as an adult, venturing East against the Khazars and the Bulgars. 972 – Svyatoslav was killed in a Pecheneg ambush while returning from one of his frequent campaigns against the Greeks. 973 - The reign of Yaropolk began and was complicated by quarrels with his two brothers, Oleg and Vladimir. 978-980 - Yaropolk proved himself victorious against his brother Oleg but died at the hands of men of his other brother Vladimir. After inheriting the throne, Vladimir initially upheld pagan practices and worshipped Perun. 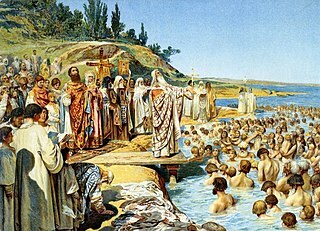 988 - Vladimir was baptized into Orthodoxy, which later became referred to as the baptism of Rus because it was followed by a wide-spread Christianization of the Rus' people. 1015- Following Vladimir’s death, Svyatopolk inherited the title of the Prince of Kiev and became known as Svyatopolk the Accursed for his violent actions towards his siblings. 1019 - Svyatopolk was overthrown by his brother Yaroslav the Wise, whose reign brought an end to the unified kingdom of Rus but laid foundation for the development of the written tradition in the Kievan Rus. 1054 - After Yaroslav’s death, the kingdom was split into five princedoms with Izyaslav ruling in Kiev, Svyatoslav in Chernigov, Igor in Vladimir, Vsevolod in Pereiaslav, and Rostislav in Tmutarakan’. 1076 - Vsevolod held a victory over his four rivals and became the Grand Prince of Kiev. 1093 - After Vsevolod’s death, Svyatopolk reigned over the Kievan Rus. 1113 – Rise to power of Vladimir Monomakh, whose religious testament and prayers were appended at the end of the Chronicle by monk Sylvester, working from St. Michael’s monastery in 1116. The Russian Primary Chronicle is vibrant with Christian themes and biblical allusions, which is often argued to be reflective of the text’s monastic authorship. Aleksandr Koptev remarked that despite its categorization as the Old East Slavonic Literature, the Chronicle also belongs to the genre of Christian literature. In the introduction, the chronicler was dedicated to exploring the biblical origin of the Slavic people, tracing their heritage to the times of Noah. In numerous occasions throughout the text, the chronicler openly discusses the pagan Slavs in a condescending manner, saying “for they were but pagans, and therefore ignorant.”:65 Later in the Chronicle, one of the most pivotal moments of the narrative is Prince Vladimir’s conversion to Orthodox Christianity which ignited extensive Christianization of the Kievan Rus. According to the so-called 'Korsun Legend,' presented in the Chronicle just preceding Vladimir’s baptism, the Prince took possession of the Greek city of Korsun (Chersonesus) located in the Crimean Peninsula, in an attempt to gain certain benefits from Emperor Basil. Following Vladimir’s successful conquest of the city, he demanded that the Emperor’s 'unwedded' sister be given up for marriage with him. Upon hearing the news from Korsun, emperor Basil responded that “It is not meet for Christians to give in marriage to pagans. If you are baptized, you shall have her to wife, inherit the kingdom of God, and be our companion in faith.”:112 The legend concludes with Vladimir’s embrace of Christianity at the church of St. Basil in Korsun and his marriage to the Emperor’s sister, Anna Porphyrogenita. For centuries after the Chronicle’s creation, the legend’s factuality had been subject to an extensive debate. 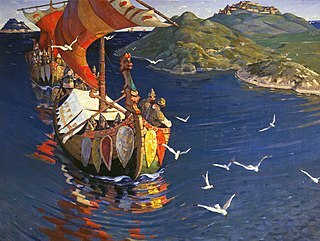 Many historians, antiquarians, and archaeologists had attempted to determine the actual location of Vladimir’s conversion by synthesizing textual evidence of the Chronicle with material evidence from Crimea. Their efforts became known in the realms of historical discipline as the “archaeology of the Korsun legend.” This search culminated under Archbishop Innokentii’s diocesan administration (1848–57), when in the ruins of Chersonesos, archaeologists unearthed the foundations of three churches and determined that the one containing the richest findings was allegedly used for the baptism of the Kievan Prince. The unearthed material evidence proved sufficient to pinpoint the real location of the legend’s events with reasonable accuracy. In the early 1860s, the Eastern Orthodox Church began construction of The Saint Vladimir Cathedral in Chersonesos, which has been destroyed on three separate occasions after first being erected and was renovated each time thereafter. The cathedral last faced destruction during the October Revolution and was not restored until the fall of the Soviet Union. It has been argued that by honoring Vladimir the Great and his contribution to the Eastern Orthodoxy, the cathedral serves the purpose of validating Russia’s historical ties with the Crimean Peninsula, the accounts of which are preserved by the Chronicle. ^ "The Tale of Bygone Years– Internet Encyclopedia of Ukraine". ^ a b c d e f g h i j k l Cross, Samuel Hazzard; Sherbowitz-Wetzor, Olgerd P. (translators & editors) The Russian Primary Chronicle, Laurentian Text. The Mediaeval Academy of America, Cambridge, Maschusetts, 1930 & 1953. ^ Skylitzes, John, and John Wortley. John Skylitzes: A Synopsis of Byzantine History, 811–1057: Translation and Notes. Cambridge University Press, 2010. .
^ a b c Duczko, Wladyslaw. Viking Rus : Studies on the Presence of Scandinavians in Eastern Europe. Leiden, Netherlands: Brill Academic Publishers, 2004, page 202. ^ "Chronicles– Internet Encyclopedia of Ukraine". ^ a b c Isoaho, Mari. “Shakhmatov’s Legacy and the Chronicles of Kievan Rus’.” Kritika, no. 3 (2018), page 642. ^ Koptev, Aleksandr. “The Story of ‘Chazar Tribute’: A Scandinavian Ritual Trick in the Russian Primary Chronicle.” Scando-Slavica 56, no. 2 (December 2010): 212. ^ a b c Mara Kozelsky. “Ruins into Relics: The Monument to Saint Vladimir on the Excavations of Chersonesos, 1827-57.” The Russian Review, no. 4 (2004): 656-670. ^ Romey, Kristin M., and Ludmila Grinenko. “Legacies of a Slavic Pompeii.” Archaeology 55, no. 6 (2002): 21. ^ Karamzin, Nikolaj Mihajlovič. Istoriâ gosudarstva Rossijskogo. Moskva: OLMA Media Group, 2012, v. I, Chapter II. ^ Likhachov, Dmitry. Velikoe nasledie: Klassicheskie proizvedenija literatury Drevnej Rusi. Zametki o russkom. Moscow, Russia: Logos, 2007, page 342. ^ Likhachev, D.s., Deming Brown, and et al. “Russian Culture in the Modern World.” Russian Social Science Review 34, no. 1 (February 1, 1993): 70. ^ Lunt, Horace G. “On Interpreting the Russian Primary Chronicle: The Year 1037.” The Slavic and East European Journal 32, no. 2 (1988): 251–64. ^ Konstantonovich, Konstantin, and Aleksey Shakhmatov. Povest’ Vremennikh Let. Introduction. Petrograd, Russia: Izdanie Arheograficheskoj Komissii, 1916, v. I. ^ a b c Danilevskiy, I.N. Povest’ vremennyh let: Germenevticheskie osnovy izuchenija letopisnyh tekstov. Monography - Moskow: Aspekt-Press, 2004, page 133. ^ Romensky A.A. “Primary Rus’ Without The Primary Chronicle: New Round Of Debate Aabout The Early History Of Eastern Europe (Book Review: Tolochko A. P. 2015. Ocherki Nachalnoj Rusi. Kiev; Saint Petersburg: ‘Laurus’ Publ. ).” Materialy Po Arheologii i Istorii Antičnogo i Srednevekovogo Kryma, no. 9 (2017): 543. Chadwick, Nora Kershaw (1946). The Beginnings of Russian History: An Enquiry into Sources. Cambridge University Press. ISBN 0-404-14651-1. Velychenko, Stephen (1992). National history as cultural process: A survey of the interpretations of Ukraine's past in Polish, Russian, and Ukrainian historical writing from the earliest times to 1914. Edmonton. ISBN 0-920862-75-6. Velychenko, Stephen (2007). "Nationalizing and Denationalizing the Past. Ukraine and Russia in Comparative Context". Ab Imperio (1). Ostrowski, Donald (ed. ), Povest' vremennykh let (in Russian and English) , includes an interlinear collation including the five main manuscript witnesses, as well as a new paradosis, or reconstruction of the original. "Laurentian Codex 1377: digitisation of the Laurentian Codex, including transliteration and translation into modern Russian, with an introduction in English" (in Church Slavic and Russian). National Library of Russia. 2012. Hazzard Cross, Samuel; Sherbowitz-Wetzor, Olgerd, eds. (1953) . The Russian Primary chronicle: Laurentian text. The Mediaeval Academy of America. Pravoslavnyi hristianin. Tale of Bygone Years - Animated Documentary (HD) (in Russian). Video, 2014. 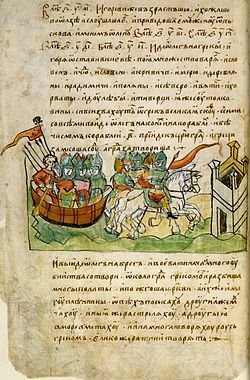 The Radziwiłł Chronicle is one of the Old East Slavic illuminated manuscript held by the Library of the Russian Academy of Sciences in Saint Petersburg. It is a 15th-century copy of a 13th-century original. Its name is derived from the Princes Radziwiłł of Grand Duchy of Lithuania, who kept it in their Nesvizh Castle in the 17th and 18th centuries. Laurentian Codex or Laurentian Chronicle is a collection of chronicles that includes the oldest extant version of the Primary Chronicle and its continuations, mostly relating the events in Northern Russia (Vladimir-Suzdal).